Located in the temporal bone, the inner ear is formed by the bony labyrinth, sheltering the membranous labyrinth, a system of vesicles and canals. The casting of the osseous cavities are the same as the shape of the membranous ones. This bizarre sculpture comprises, from front to back, three parts: the cochlea, the vestibule and the semi-circular canals. 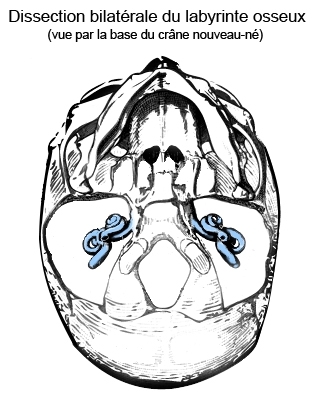 The vestibular apparatus, the balance organ, comprising a number of sensory receptors: the maculae of the saccule and the utricle and the three ampullary crests or cresta of the semi-circular canals. These structures are home to the sensory receptor cells that transforms mechanical energy from the cilia into nerve impulses.